In March of 2018, PLG Consulting offered an insightful white paper and webinar highlighting the pronounced challenges that shippers faced in an extremely difficult trucking market. A few critical components included driver supply, driver turnover/retention, driver wages, ELD mandate and inflation. While a number of struggles remain, some conditions have softened in Q4 2018, giving logistics buyers more room to breathe. What is in store for 2019? As discussed in our previous truck white paper, early 2018 offered a hot shipping market which put a high demand and stress on trucking capacity. A constriction in the driver workforce because of retirements, driver turnover (over 90% in early 2018) and problematic recruiting by carriers further compounded the issue. What will 2019 Bring to Your Company? 2019 mirrors certain factors that contributed to the trucking market volatility of 2018. However, some of the conditions have changed this year that are worth noting. If your business depends on truck shipping, you are aware that driver shortages continue to contribute to a sporadic shortfall of available trucking capacity. We expect the driver shortage, including the contributing factor of problematic driver retention, to remain a primary concern for the industry this year and for several years down the road. The latest driver turnover statistic according to the ATA has improved slightly to 87% for Truckload carriers, which remains a significant challenge. The ATA also estimates the industry is short more than 50,000 drivers. 2018 driver wages grew at vastly different levels based on type, region, and truck market, but overall trucker pay was up around 10% on average over the year. Higher pay and better benefits will help ease the truck capacity shortage as new drivers are drawn to become truckers, but an increase in driver pay translates to similarly higher rates for shippers. We expect both driver wages and trucking rates to go up about 3 to 5% on average this year. According to economists and reported at Transport Topics, a slowdown in Q4 2018 indicates demand growth rate is expected to decrease in 2019. But even with a slowdown in growth, 2019 shippers will face significant worries. 2018 was a banner year with total freight hauled by for-hire truck drivers up 7.2% over 2017. That reflects tremendous industry growth, and a decrease in freight shipping would need to be significant to ease the limitations on truck availability. But FTR Transport Intelligence projects freight volume will continue to grow more than 3% in the first half of the year and slow to 2% in the second half of 2019. For shippers, this means you are not out of the woods just yet. 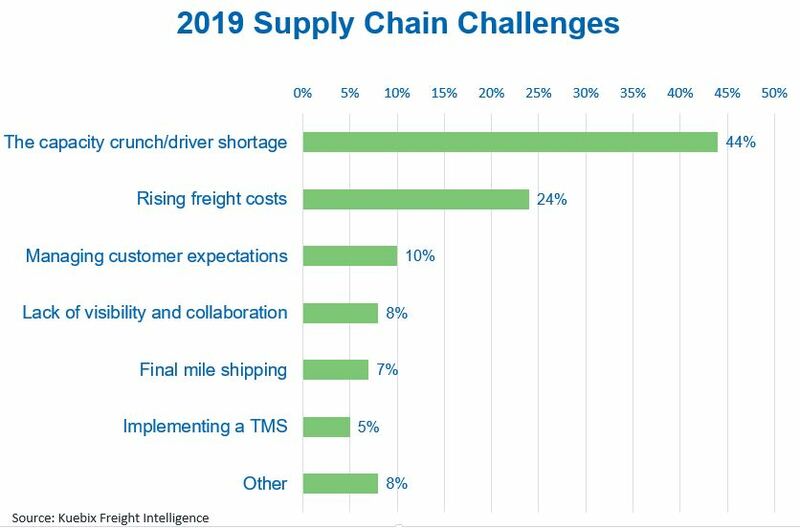 2019 will remain a tough year to be a trucking buyer. The ELD mandate brought its own set of issues to the first half of 2018 and took an estimated 5%-10% out of total truck capacity. The problems were largely felt in short- to medium-length lanes of under 600 miles. Since the second half of 2018, carriers are adjusting operating plans and accommodating the rules. The ELD mandate is now part of current capacity, and we expect that any modifications to the hours of service (HOS) rules that are being lobbied in Congress will have minimal impact to total trucking capacity. Now that ELD is the law of the land, it has leveled the playing field on HOS and is built into all trucking companies’ capacity structure. Turbulence in U.S. domestic politics, as well as the ongoing global trade wars, are causing intermittent havoc on Wall Street and across the world, pushing shippers to make some difficult decisions regarding their operations and supply chain. In 2019, the US-China Trade War, NAFTA, Global-National Regional Economies, e-commerce, and the political climate could each affect import volume and its associated shipping requirements. A volatile market often encourages a close look at transportation and logistics expenditures, large cost drivers for manufacturers. Not to mention, many manufacturers have built their supply chain over a span of decades and will find it challenging to establish new supply chains and avoid costly tariffs. The marketplace and industry are constantly changing, and leading supply chain organizations stay ahead of the cycles. Take control of your supply chain by systematically and objectively analyzing your processes, systems and performance before making drastic changes. Implement steps which will help reduce your risk in the ever-changing marketplace and keep you ahead of your peers. What can you do? A benchmarking study reveals gaps in your current logistics operations performance and illuminates areas for improvement as you compare your rates, delivery performance, inventory levels and staffing structure against your peers. After your analysis, create an action plan targeting actions that will have the greatest impact on your overall business goals. Start by forming a small team to construct a Value Stream Map (VSM) of your supply chain. Upon completion of your “as-is” state, your team should brainstorm ideas to reduce excessive cycle times and queues that may have become apparent in the exercise. The team should then build a “to-be” state, chartering projects over the coming months to make the most significant impact. Regular team check-ins are necessary to ensure project completion and performance improvement. After completing the benchmarking and supply chain optimization processes, your team will be much more knowledgeable about the most important requirements from your trucking providers – capacity availability, reliability, terms, technology, or personnel support in addition to rates. Based on your new knowledge, construct a weighted decision matrix of key factors that will be part of your decision matrix as you source each type of trucking. The experts at PLG Consulting believe 2019 will continue to be a challenging and more expensive period to bring goods to market. Shippers must continually look at ways to improve truck utilization, reduce network operating costs, find new and different types of capacity, and reduce loading and unloading cycle times. PLG Consulting can assist you in speeding up the process of optimizing your supply chain and logistics operations. Because our consultants are industry veterans with specific expertise and experience across all transportation modes, we routinely deliver annual cost savings to our clients in excess of 10x our professional fees. Contact us today at +1-312-957-7757 to discuss ways to transform your logistics from a cost center into a competitive advantage.